Music in indeed the universal language. And the Philippines is very blessed to have a musical culture, especially a choral-singing culture where there are just so many choral groups already–in the churches, in schools, in offices, both private and public, and in communities. Our choral groups are among the most known in the world. They share God’s gift of music to different parts of the world, participating in choral festivals and winning international competitions. Our choral directors are sought-after clinicians and adjudicators both locally and internationally. Even our own choral music is popular, and our composers are commissioned by other world-renowned choral groups to create new music for them. And what better way to celebrate choral music than through this annual event called World Choral Day. World Choral Day this year will be celebrated on December 7th. The International Day of Choral Singing is an international choral event to extol the values of solidarity, peace and understanding. This is an initiative of respected conductor and composer, Alberto Grau from Venezuela, which started in 1990. 1. Pop in any choral music CD to start up your day. Or go to the internet and get to know a new choir through their video performances. Or hear Mass, and you’ll surely be blessed and delighted to hear church music sung, most probably by choirs. 2. Attend a choral concert. There is nothing like watching a live choral concert. You may check out Kumpas: The Philippine Choral Community Newsletter, a project of the Philippine Choral Directors Association for a rundown of upcoming concerts. 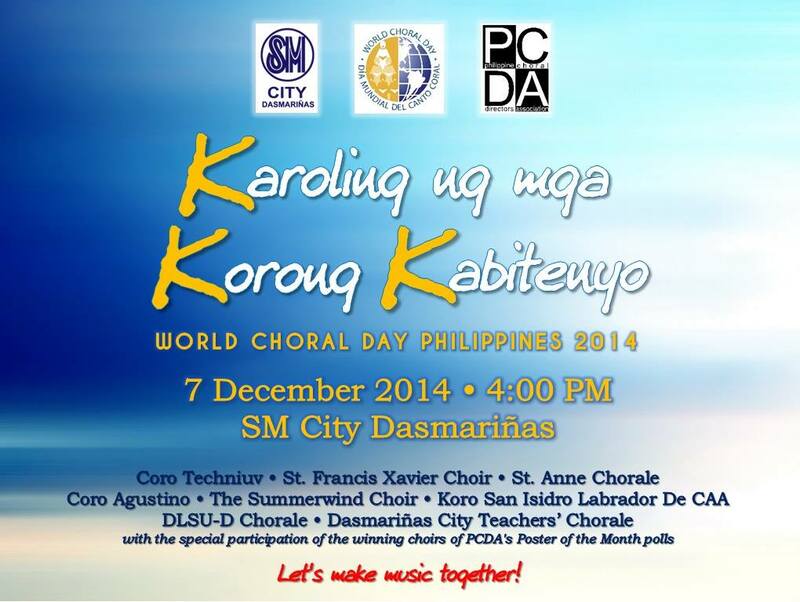 The PCDA will have its own World Choral Day celebration on December 7th in Cavite. PCDA celebrates World Choral Day! 3. If you a choral director or chorister and you will have a choral concert anytime this month, register your event as part of the World Choral Day. 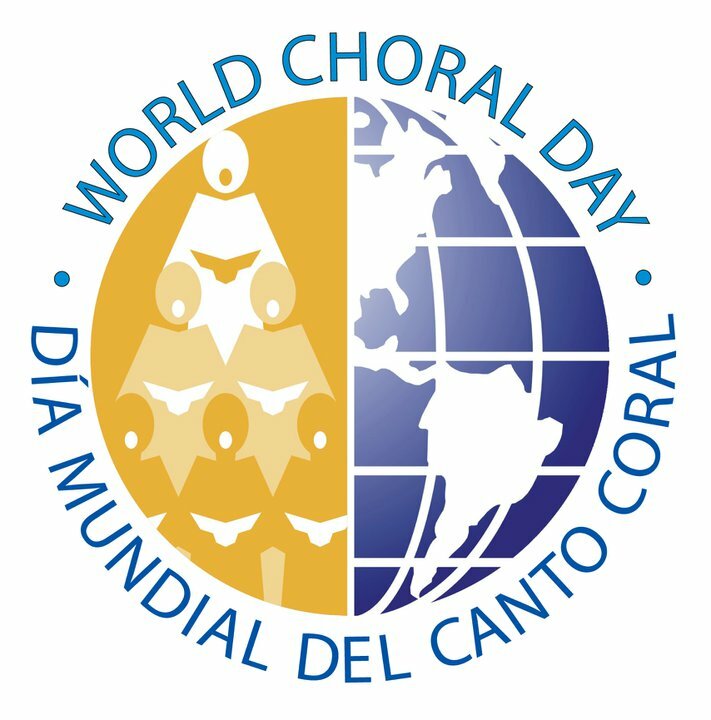 Visit http://www.worldchoralday.org/events/subscription and be part of the celebrations. Oh, and make sure to include Original Pilipino Music in your repertoire! For the choral groups having a concert this month, please read the Proclamation written for the World Choral Day. This is always read during the choral concert. Ideally, the audience should have a copy so they could read along. The Proclamation has been translated to 14 languages, and aims to foster world peace and understanding through choral singing. Click this link for the Filipino and Cebuano translations which you can use for your concert. Other languages can be found here. Here is the reading of the Proclamation in Filipino read three years ago as led by Mr. Ryan Cayabyab, in a Thousand-Voice Concert he spearheaded. The translation was written by PCDA Secretary Joy Nilo. 4. Support our local choral artists by booking a choral group for your next event purchasing original CDs, watching their concerts or sponsoring their fundraising projects, which helps a lot in bringing their music to more audiences. If you’re a choral director, you should start building your own library of choral works. You can purchase choral compositions and arrangements of our Filipino composers/arrangers or commission them for new works. Do you have more ideas? Share with everyone in the comments section. Don’t forget to like Touringkitty, Kumpas, and World Choral Day Philippines to be updated with the celebrations. The Kumpas Page is powered by yours truly, Touringkitty. I am a member of the PCDA and a volunteer of the organization as Online Content Manager. *Credits go to the Youtube video owners.